Studio 2 Pilates is a beautiful, bustling and inspiring Pilates & Barre studio in the Southern Suburbs of Cape Town. Situated in Mowbray, we offer exercise classes to individuals and small groups of women of all ages and levels of fitness. Whether you’re interested in trying Pilates or Barre for the first time or are looking for a studio to continue your practice, we hope that you will find most of the information you need here on our website. 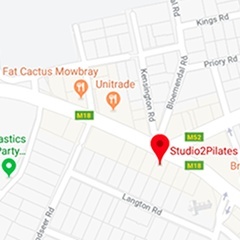 If you would prefer to contact someone, please don’t hesitate to contact Dianne Piketh, the owner and manager of Studio 2 Pilates by using our contact page, where you’ll find our exact location in Mowbray and a query form. We offer all prospective clients a free introductory class so if you’d like to see the studio for yourself, get in touch and let us know when you’d like to come in! What do people say about Studio 2 Pilates? What makes Studio 2 Pilates different from other Cape Town studios? Our aim is to offer a unique experience by ensuring that our Pilates & Barre classes are tailored to each client. For this reason, we keep our classes small, with a maximum of 6-8 ladies training together at any one time. We strongly recommend, if possible, that our clients sign up for regularly scheduled classes with the same group of ladies and instructor rather than doing drop-in classes. This makes sessions an opportunity to build strong connections as well as strong bodies! Clients can of course make up classes at different times when schedules become challenging. However, we believe that doing the majority of your training at a consistent time with the same group of ladies will greatly improve your experience. 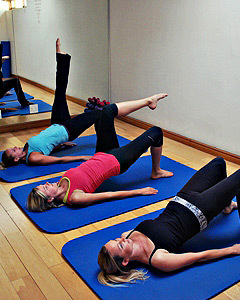 Practising Pilates offers many benefits and these are not limited to physical fitness. Regular classes can also help you relieve chronic pain, address postural problems and alleviate stress. For a more detailed explanation of the benefits, have a look at our article: 6 reasons why you should be doing Pilates. You can read more about how Pilates benefits your body and mind on our Pilates page. The only thing missing from a Pilates based exercise program is that all important cardio element. Well look no further! Our barre classes will have your heart pumping, your body tingling and your hips swinging all in one up-beat, exhilarating class. With the combination of Pilates, stretching, dance and cardio all in one class, you’ll be sure to build core strength, work on flexibility and burn fat all while bouncing to the beat of the music! Find out all about this fun class on our About Studio 2 Barre page. Sometimes all you need is a good stretch! This class is a great opportunity to spend some time releasing and relieving those tired and stiff muscles. Reward your body by doing something that it really needs and deserves. A regular stretch class will improve flexibility, mobility and in most cases will help to alleviate pain and lower stress levels. Find out more about our Stretch classes on our Studio 2 Stretch page. If you’re looking to find out more about Studio 2 Pilates, you can find lots of information including prices, class details and an introduction to our instructors using the links above. Our FAQ page will address lots of the questions you might have, particularly if you’re just getting started. Please feel free to have a look at the Studio 2 Pilates Blog which includes lots of useful information about our studio, nutrition and exercises you can try at home. You can stay in touch and find out more by liking us on facebook or subscribing by email using the forms on the right of this page or by following us on twitter (@Studio2Pilates).